Oh yes, I forgot to mention my stir-fry experiment. My Sweet and Sour stir-fry was a complete success! Now I did end up chucking my bowl (plastic by the way) into the extremely hot wok by accident, along with the raw chicken still IN the bowl. Instead of my instincts kicking in, which would be to quickly grab the bowl, I decided to do a hysteric dance thinking ‘oh s***t! !’ while the plastic sizzled away in the wok, the chicken casually lying in the bowl taking it easy. I literally thought it was going to go on fire… but I managed to grab the bowl out and I just dumped my chicken in, I was far too distraught/annoyed to care anymore. The underside of the bowl (newly christened ‘chicken-bowl’) now has a new white hue to remind me of the incident. In my first post I stated ‘I hope I don’t burn a hole through the wok’…. how nearly right I was. Nevertheless, it was actually lovely (after all that). I’m now content knowing that I can actually cook something when I go to China… or I might just check out a food vendor to be safe. What Made Me Take The Plunge. It all happened a year ago. I was casually checking my College email account when an email entitled ‘WOULD YOU LIKE TO VOLUNTEER IN TANZANIA?’ appeared. The email was about volunteering in Tanzania for two weeks down in the foothills of Kilimanjaro. I read it and thought ‘that actually would be a great thing to be able to do.’ So I mentioned it to the family, and to my surprise, they thought it would be a great thing to do. After much deliberation, I decided that I’d fill in the forms and give it in to my College. So that was that. I carried on with my usual mundane work; my Dissertation was due soon, there were plenty of presentations, essays and procrastination needed to be done. Anyway, about a week later I got a email stating that I’d been picked to do an interview! They insisted that it was more of an ‘informal talk’ but once the word interview is mentioned, ‘informal’ goes out the window. The interview came and went, plenty of talk was done about fundraising; they had to make sure I could fundraise enough money for the trip. I had done plenty of fundraising during college so that boded well for me. Although I talked literally non-stop and ended up saying things that I look back on, cringe and think WHY DID I SAY THAT?? they must have seen potential in me and I was picked to go. Though our destination changed from North to West to finally the East, we, comprising of another 5 of my fellow College students finally ended up in a Maasai community. It was hands down, the BEST experience of my entire life. (so far I’ll add) We were staying in a Maasai village called Twa Twa Twa, near the town of Morogoro. Yes that is its name I’m not making it up. It is here that I would spend 2 great weeks living amongst the Maasai tribe, something that I thought I’d never do! Myself with my Maasai-irish family in Twa Twa Twa. Even though we ate the same food day after day, ate bread that was in my opinion nowhere near edible due to its hardness, and having freezing showers at 7am, they were fantastic two weeks. Our daily objectives were to paint the children’s primary school, ie sanding bare walls ready for the paint (they don’t put plaster on the walls), and painting the inside and outside of two classrooms. We witnessed a special ceremony held only every 25 years when boys become men, or in Maasai terms ‘Warriors’, which was a great privilege to see and be invited to. During the evenings we would discuss with a fellow Maasai about our lives back in Ireland, why we only marry one person and how are lives are different to theirs. Strange topics like why are skin/hair is different, why my neck got red (sunburn) and what the dots on our arms (freckles) were crept up too. Not only that, but we managed to teach a Maasai a cúpla focail (couple of words) of the Irish language… like come on, who knows a Maasai that can speak Irish? 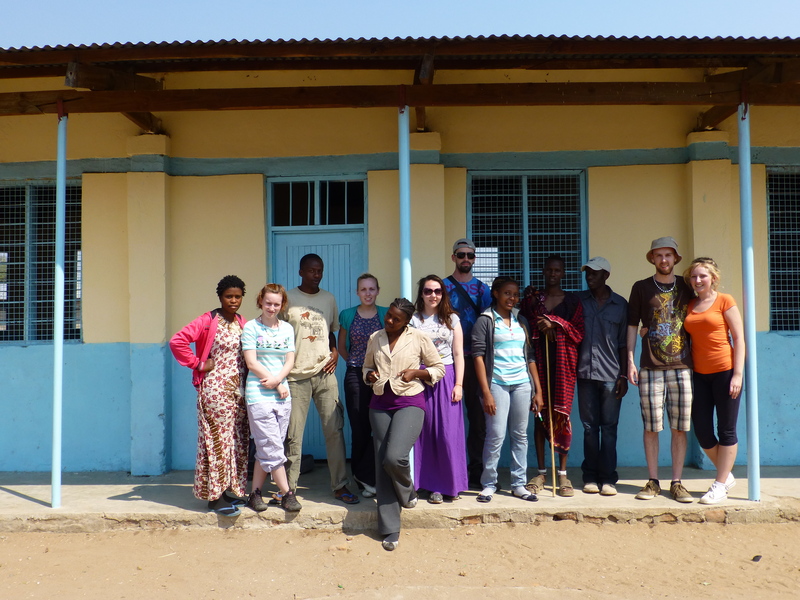 Our newly painted classroom’s with our fellow Tanzanian volunteers. After two weeks and our volunteering was finished, we decided to venture off into the wild, where we visited Mikumi National Park. Plenty of buffalos, warthogs and giraffes were seen, but the lions weren’t in a mood for visitors. Our van got chased by a HUGE male elephant and to make matters worse, down the path we got stuck in a big hole where the driver and 2 others from my group had to get out and literally push it out, metres from a male elephant, so the mere thought of lions and cheetahs attacking us while we were at our most vulnerable made up for the no show! We then decided to catch a ferry to paradise, aka Zanzibar. This place was just unbelievable. Narrow streets winding their way through old buildings, one wrong turn and you would be lost. Our first day saw us heading to a nearby island called Prison Island. It’s now a renovated (and very swanky) hotel, but the public can venture through the grounds. We sunbathed, snorkelled, got Henna tattoos and drank cocktails by the beach until we had to unfortunately catch our plane home in a weeks time. So… in a nutshell, it was THAT, rather long blog, that led me to where I am now. When I was back to my boring, average, non-exciting life in Ireland, the Maasai-irish family met up once again, where one of my friends said she was jetting off to Japan to teach English. She explained she just completed a TEFL course (teaching English as a foreign language) so that got me interested. To work and travel at the same time?? To experience and live in a completely new country?? Yes Please. It was too good to resist. So I researched, joined an internship with a company, and decided to hit China as my first TEFL experience. With no idea where I will be located in China, not the faintest idea of the level of children I’ll be teaching, or how I will actually cope in China flittering into my head now and again, I have no doubt it’ll be some experience… If its any kind of experience I had in Tanzania, then I should have a ball! I think that quote sums up today in Ireland. The glorious weather we have been having here has uplifted everyone. We rarely have great weather, but when we do, everyone is happy, positive, enjoying life, eating ice-creams. It’s the cloudless skies and beaming sun that transforms Ireland into a pretty beautiful place, with Irish people suddenly becoming rather proud of their little Island. May the sunshine continue!